Average Weight	: 13 - 15 lbs. The Cairn Terrier originated in the 1500s, in the Highlands of Scotland and the Isle of Skye among the vast open plains where the only permanent form of landmark markers were piles of stones called cairns. Cairn Terriers are one of Scotland's original terriers, where Captain Martin MacLeod is credited with developing one of the oldest strains of the breed. The Cairn Terrier is one of the oldest and the smallest terrier breeds of dogs in the world. It was originally bred in the Scottish Highlands, among the vast open plains where the only permanent form of landmark markers were piles of stones called cairns. The Cairn Terrier was named after these, for they hunted vermin and small game that resided in and around the cairns. This dog is often considered "natural" looking because of its often unkempt and raggedy like coat, not to mention that mischievous twinkle in its eyes. At one point it was considered the same breed as the Scottish Terrier and the West Highland White Terrier up until the 1900s when the breeds began to be bred separately. The Cairn is also said to be related to the Skye Terrier. Originally all terrier breeds in Scotland were classified as Scotch Terriers. In 1873, a new system was implemented and Scotch Terriers were separated into two classes: Dandie Dinmont Terriers and Skye Terriers. The Cairn was named for the way it would squeeze down into "cairns" and bark at fox and badgers until the farmer could arrive to kill them. "Cairns" were rock dens where badgers and fox lived, usually in piles of small stones used to mark Scottish farm borders and graves. The first Cairn Terriers were imported to the United States by Mrs. Henry F. Price and Mrs. Byron Rodgers in 1913. In both the U.S. and in England, the Cairn and the West Highland White were interbred until 1917, when the American Kennel Club barred registration to any dog from such interbreeding. •	Can be aggressive if not properly socialized. •	As a Terrier is naturally feisty and will not back down if provoked to fight even large dogs. •	A Natural hunter these feisty dogs will chase other pets so not great with cats. •	Can be good with kids. •	Sensitive to a fault this is a dog that can be ‘voice trained’. •	Great Apartment/Condo dog, Moderate exercise only. Here are other interesting tidbits about our favorite scrappy pets. Actress, singer and pop icon Liza Minelli used to own a red coated Cairn Terrier named Lily. She is a well known dog lover and has maintained a number of pets over the years. Lately, reports claimed that Minelli was one of the judges for a Cairn Terrier dog show. Because of selective breeding that was geared more towards the dog's ability to hunt, the Cairn Terrier has developed very few resistances or anti-bodies to fight off common diseases. In fact, this breed of dog is often plagued with various ailments at one or more points in its life. Strangely, the Cairn Terrier is proving to be severely allergic to many things, including fleas! "I don't think we're in Kansas anymore, Toto." That was one of the more memorable lines in the 1995 blockbuster tornado movie Twister, which starred Helen Hunt in the lead role. The first scene in the movie showed a man and his Cairn Terrier pet in a storm cellar. The cellar was eventually spinning in the tornado. In 1957, a movie called Pal Joey (which starred Frank Sinatra, Kim Novak and Rita Hayworth) featured a Cairn Terrier named "Snuffy." Snuffy had no more than 15 minutes on the silver screen, but apparently did better with other appearances like a spot in I love Lucy, Anatomy of a Murder, and Dennis the Menace. The Cairn Terrier's real name was Danny. In a 2006 study, the Cairn Terrier is at 35th place, tied with the Kerry Blue Terrier and the Irish Terrier, as dogs who can understand and obey new commands or instructions. The number one position belongs to the Border Collie. In one part of the 1993 Disney Halloween Comedy Offering Hocus Pocus, a Cairn Terrier set the stage for the coming of the 3 witches who were portrayed by Kathy Najimy, Sarah Jessica Parker and Bette Midler. Terry, a.k.a. Toto from the 1936 film The Wizard of Oz is considered to be the most popular Cairn Terrier in the world. 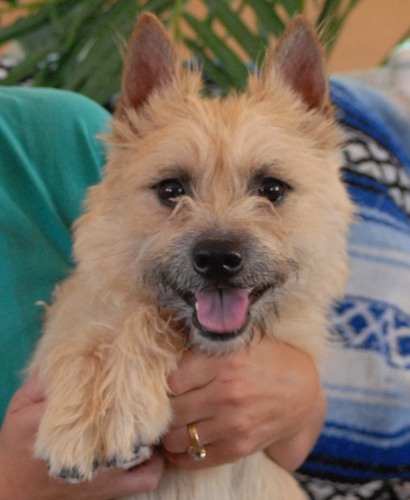 Originally, Terry was an abandoned dog rescued by Carl Spitz who eventually managed to make Terry the Cairn Terrier popular in the Hollywood acting circle. For families and people that want a dog that is energetic, happy, intelligent and a very loyal pet and protector the Cairn Terrier is a perfect match. They are outgoing in their personalities and often don't seem to realize that they are a small dog. A natural watchdog, the Cairn Terrier can be stranger, dog and pet aggressive if not properly socialized. The Cairn Terrier will often attack much large dogs in their role as protectors, so care must be taken to keep them safe and away from larger breeds that could easily cause the smaller dog injury. With proper socialization they can be excellent companion dogs for both other breeds of dogs as well as non-canine pets. A natural hunter, Cairn Terriers will chase and need to be kept within a fence or on a leash to prevent them from running off on a hunt. Cairn Terriers are good family dogs although they can be snappish and somewhat possessive of their food and toys. In a family with children the Cairn Terrier will always be involved in the children's games and play and loves to run and romp. Their boundless energy makes them a terrific pet for active families. Chasing balls and playing fetch is a favorite pastime of many Cairn Terriers. Cairn Terriers are a people breed of dog and need to have contact with their owners and family on a regular basis. They do not do well if left alone for long periods of time or kept in a kennel. Bored or lonely Cairn Terriers can quickly develop destructive or problematic habits such as constant barking or problem digging. Consistent, positive training and challenges keep this breed stimulated both mentally and physically. Cairn Terriers quickly learn new skills and tricks and love to work for praise and attention. Cairn Terriers do need affection and attention and love to find a comfortable spot on the couch or, even better yet, on a lap and spend time with the family. They make an excellent house dog and will be very active. They do love to be outside and run and play, so a yard is recommended but with regular walks it is not absolutely required. Without the right amount of exercise the Cairn Terrier can become somewhat difficult to work with and may become less compliant and more headstrong. Despite the natural good humor and rather independent attitude of the Cairn Terrier they are a breed that does not respond well to punishment. They are surprisingly sensitive to reprimands and changes in the owner's voice, so care needs to be taken to avoid speaking in harsh tones or raising your voice with this breed. Although not prone to being timid they can become more aloof and independent if they are mistreated, teased or not attended to in a positive fashion. Generally the Cairn Terrier is a very healthy breed. Some of the common Health Problems that are seen are a tendency to gain weight leading to obesity and flea Allergies that result in skin rashes, excessive licking and scratching. There is also a problem in some Cairn Terriers with Cataracts that cause vision problems as the dog matures. Grooming the Cairn Terrier is relatively easy and simple and does not require a professional groomer but it does need to be done on a consistent, regular basis. In addition to regular grooming, the hair around the ears and eyes should be regularly trimmed to avoid irritation. At least twice a year the Cairn Terrier should have all the long and dead hairs removed from his or her coat. This is done through a process called stripping. Stripping can be done by hand by simply pulling out the long or dead hairs with the direction of hair growth. This is always back and down when you are stripping the body of the dog. Cairn Terrier are very adaptable dogs to living in small spaces. They do need regular exercise if a yard is not available as they are prone to putting on weight if not provided with opportunities to run and play. Daily walks are recommended for the breed, however they also love to play in the yard with family or chase a ball or stick. The Cairn Terrier is a good jogging companion provided the level of exercise is increased gradually. Due to the patellar luxation that can occur in the breed jumping is not recommended. If the Cairn Terrier is kept with other dogs he or she will self-exercise and play with the dog companions. This breed is very sensitive to correct and simply ignoring bad behavior and withdrawing attention for a few minutes is usually all the correction the dog will need. They are extremely quick to pick up on new tricks and commands, and often seem to understand what the owner wants them to do. Cairns will also learn what brings them attention, and will quickly learn tricks like ringing a bell for water or bringing the leash to encourage owners to go for a walk. They are excellent candidates for both obedience and agility classes and seem to love to perform for audiences of any size. One aspect of training that must be addressed is possessiveness. Terrier breeds, Cairns as well, will tend to snap and protect their food and toys. Teaching the dogs as puppies to relinquish food dishes, bones and toys is critical to prevent negative behaviors from forming as the dog gets older. Cairns can also be problematic barkers to teaching them to stop barking on command is a very important part of a Cairn Terriers early training. A Cairn Terrier left to his or her own devices will find something to do to entertain themselves. They are powerful diggers and love to spend time digging in soft dirt, often to the dismay of a gardener. Cairn's can be taught to dig in selected areas rather than all through the yard, which is a great option to prevent unexpected landscaping changes.